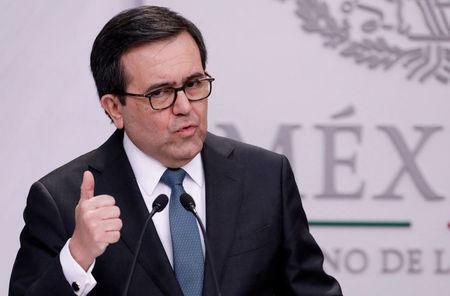 WASHINGTON (Reuters) - Mexico's Economy Minister said on Friday that bilateral talks with the United States over the future of the NAFTA trade deal will drag into next week, and the timing of Canada's return to the negotiations will depend on how fast they resolve issues. Speaking as he left a meeting with the U.S. trade team in Washington, Ildefonso Guajardo said the return of Canada, the third country in the trillion dollar trade zone, would depend on solving bilateral elements in "the next few days or weeks." The U.S.-Mexico talks for a reworked North American Free Trade Agreement resumed three weeks ago, without Canada, after negotiations involving all three members of one of the world's largest trade blocs stalled in June. Asked if he could finish the U.S.-Mexico issues on Friday, Guajardo said "I don't think today but we are very close."